Waste Management will not provide garbage, recycling or compostables pickup Thursday for customers in all of King County and most of Snohomish. Waste Management trucks run on natural gas. 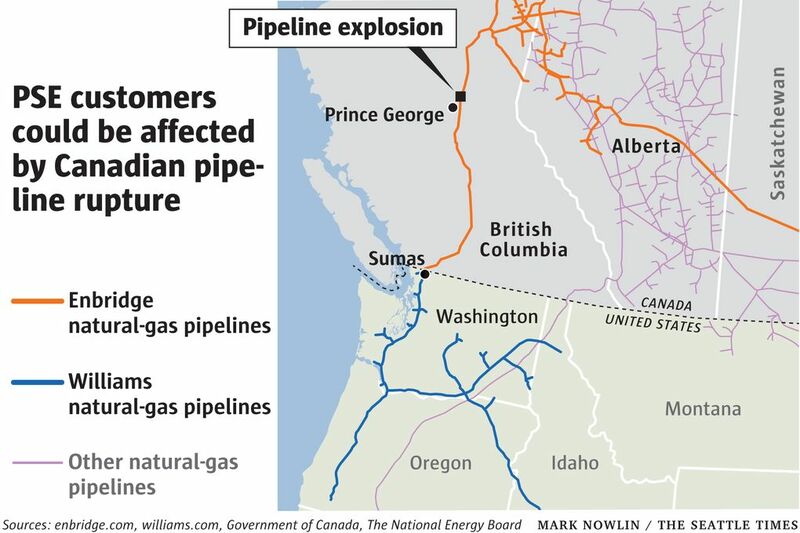 A pipeline explosion in British Columbia on Tuesday cut off the flow of Canadian natural gas into Washington, raising the risk of power outages around the state. Puget Sound Energy (PSE), Avista Corp. and Cascade Natural Gas said Wednesday that their gas supplies had been disrupted due to the explosion that occurred a day earlier and asked their customers to reduce consumption. The three companies serve almost 2.4 million customers combined, mostly in Washington, according to the companies’ websites. The explosion caused no injuries, The Canadian Press reported. Enbridge Inc., the company that owns the pipeline on the Canadian side, shut down the ruptured pipeline and a parallel pipeline Wednesday. The company received government approval to reopen the parallel pipeline, the company said in a statement at 9:25 p.m. Enbridge has now begun a “multi-hour process” to return the parallel pipeline to service. The company has not said when the ruptured pipeline may reopen. PSE, the state’s largest private energy utility, uses natural gas to generate electricity and said its natural-gas supply from the pipeline was halted between 7 and 8 a.m. Wednesday. The company hasn’t been informed when the flow will resume and is looking to make up for the deficit by tapping all other energy sources that aren’t “already spoken for,” said Duane Henderson, a PSE gas-systems integrity manager. If the situation isn’t resolved soon and the energy deficit persists, he said the company may be forced to cut power to some customers. “In order to balance out, we might start seeing some outages,” Henderson said. Possible outages would be limited to “pockets” in some local regions, he added. PSE asked its customers in a tweet Wednesday to lower their thermostats and limit the use of hot water. In addition to seeking out other energy sources, the company is trying to make up for the shortfall in natural-gas supplies by reducing consumption by 15 percent, Henderson said. Residents of King and Snohomish counties could see at least one effect of the pipeline rupture Thursday. Waste Management will not provide garbage, recycling or compostables pickup for customers in all of King County and most of Snohomish Thursday. Waste Management trucks use natural gas provided by PSE. The rupture interrupted the flow of gas, the company said Wednesday evening. It’s unclear how long service will be halted. Two-thirds of PSE’s natural-gas supplies come from underground deposits in the Vancouver, B.C., and Alberta regions. The gas travels the Interstate 5 corridor through the pipeline, according to company spokeswoman Janet Kim. 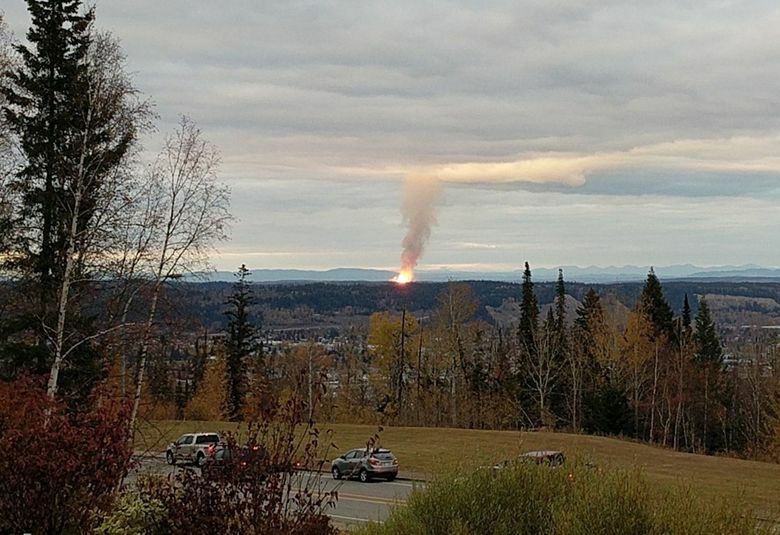 Enbridge said it suffered an explosion Tuesday near Prince George, sparking a fire and forcing about 100 Lheidli T’enneh First Nation members from their homes. Some evacuees returned to their homes Wednesday and others will return Thursday, the company said. On the U.S. side of the border, Williams Companies owns and operates the pipeline, which runs more than 1,300 miles to deliver gas to its three biggest customers: PSE, Avista and Cascade. Gov. Jay Inslee has spoken with British Columbia’s Premier John Holgan about the pipeline rupture. “We are monitoring the situation closely, and working with the industry and regulators to better understand the scope and potential duration of the service disruption,” Inslee’s office said in a statement. PSE may tap several other natural gas sources, including another pipeline, said spokesman Andrew Padula. The company did not expect immediate outages, Padula said Wednesday evening. The company provides natural gas and electricity to 825,000 and 1.1 million customers, respectively. Cascade Natural Gas said it has cut off service to its large industrial customers and those that have alternative sources of energy. “Our main goal is to maintain our service to our core customers and our residential areas, but they have not been affected yet,” Cascade spokesman Mark Hanson said. 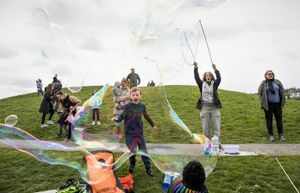 The state’s utilities are required to have plans to address major incidents, including fuel supply disruptions, Amanda Maxwell, spokeswoman for the Washington Utilities and Transportation Commission, said by phone. It’s possible that those companies may ask the regulator to approve rate changes in order to cover the costs of the disruption, she said. Staff reporter Hannah Rodriguez contributed to this report. Correction: This story has been updated to correct Washington Utilities and Transportation Commission spokeswoman Amanda Maxwell’s name and clarify the process by which utility companies may cover the costs of the fuel disruption.